At least 25 people have been killed and 50 others injured by a large fire at the main railway station in Egypt’s capital Cairo, state TV reports. 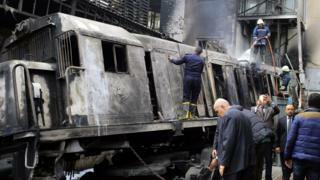 The National Railway Authority said a train collided with a concrete buffer stop at the central Ramses Station. The train’s fuel tank reportedly exploded after the crash, setting a platform and nearby buildings alight. Prime Minister Mostafa Madbouli visited the scene and said the cause of the collision was not yet known. However, he vowed to punish severely anyone who was found to be negligent. “We will identify who is responsible for the accident and they will be held accountable,” he said. Photos and videos posted on social media appeared to show the train and the platform it hit engulfed by fire, as well as people rushing to help the casualties. “I was standing on the platform and I saw the train speed into the barrier,” witness Mina Ghaly told Reuters news agency. Egypt’s railway system has a poor safety record, which many people blame on a lack of investment by successive governments and poor management. The country’s deadliest rail accident occurred near Cairo in 2002, when a fire ripped through an overcrowded passenger train, killing more than 370 people. The beginning of a real-life fairytale?